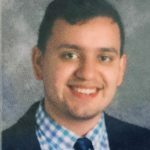 Mr. Rodriguez is happy to enter his first year teaching at Divine Wisdom Catholic Academy, where he will be teaching 7th and 8th Grade Religion. He has obtained a Bachelor of Arts Degree in Philosophy at St. John’s University and is currently in the process of obtaining his Masters Degree in Catholic Theology. Mr. Rodriguez was raised in a devoted Catholic household that upheld morality, faith, and unity as pillars of happiness and success. He received two years of Seminary formation at the Immaculate Conception Center in Douglaston, and Mr. Rodriguez hopes to inspire in the youth the same passion, love, and energy he shares for the faith. He wishes to help his students develop into virtuous young men and women as they continue to grow intellectually, physically, and spiritually. He is excited and ready to face the new school year with passion and dedication to teaching Religion.